Spacious 2 Bedroom Basement Apartment w/full Kitchen and large living room. This spacious apartment is located in a nice quiet neighborhood. The oversized living room has 2 full size couches, a fold out sofa, and plenty of room for extra kids with sleeping bags. There are 2 bedrooms with queen size beds in each. There is a full kitchen and a private entrance, so that you can come and go as you please. In this location, you will have the conveniences of shopping, movie theater, and a variety of restaurants. We are located a couple minutes off Interstate I-15. Enjoy easy access on and off I-15 freeway. Close to Hwy. 14 access to Cedar Breaks, Cedar Mountain, Bryce Canyon, Duck Creek Reservoir, and Brian head! The Cedar City Recreation Center, Lake on the Hill, Discovery Park, Baseball Fields, Cedar High School, SUU campus is a couple miles from the residence. It is the perfect location to attend the beautiful Cedar City Temple, Shakespeare Festival, Neil Simon Festival, Southern Utah University Campus, Huntsman Summer Games and much more. We are close to Zions National Park, Cedar Breaks, Bryce Canyon, Three-peaks recreation area, Kannarraville Falls, and Brianhead Ski Resort. Please park in the back driveway for easy access into the basement apartment. Highchair and portable crib available upon request. 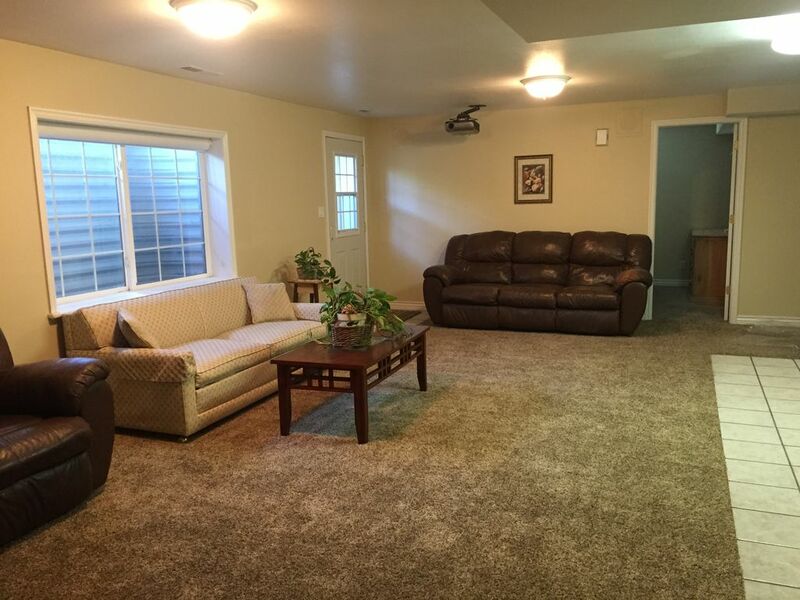 Basement was very spacious and location was close to 1-15. Denise was great to work with and kids enjoyed playing on playground. Great place to stay while we visited Zion and Bryce Canyon. One word of caution- there are pets so if you have allergies you will want to plan accordingly. In the post description of our home, it references that we have pets in and on the premises. I want those who stay with us to be comfortable and know what to expect. Thanks for your review! It was a pleasure to host your stay! We had a wonderful experience staying here! The basement apartment was the perfect fit for our family with room for everyone. Our kids even got some energy out in the backyard during our stay. Would definitely recommend to anyone visiting Cedar City. Alisha, Thank you for the wonderful review! It was a pleasure to have you stay it was great to have you have in our home. The apartment was very clean, very spacious, and has such a homey feel about it. We would love to have them stay again! Was a cute and comfortable basement. The essentials were provided in both bathroom and kitchen. We had one small issue that was taken care of promptly. Denice was quick to respond. Only thing I would warn furure guests about is the noise. If you are wanting a quiet place to rest in evenings or to sleep in this might not work for you. The foot step noise is very noticeable. Might have been a little more than usual for us beings it was the weekend before Halloween. It didn’t bother us because it stopped by 10 pm and we are early risers. The location is perfect. Easy to get to wherever you need to go in Cedar City. Neighborhood was quiet and clean.